Today was a busy day! Phew. It's almost over now (after I type this up for you). :) I was finishing the last couple things for a care package for my MIL. She is having neck surgery, for the 2nd time, and is super nervous about it. I think/hope everything will go smoothly. But on the happy note, I don't know if I've ever been so excited to send someone a package before! (This is where I do the happy clapping...I'm a dork). Back to beans: this is one of my new favorites! 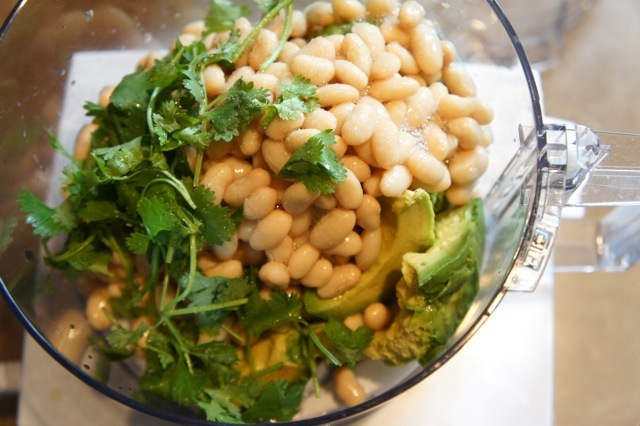 Make your favorite recipe (or mine below) for guacamole and add a can of beans (your personal choice) to the mixture. I've used white beans and garbanzo beans and both taste great. I'm sure black would be good too, but they would make your mixture not quite as bright green. I LOVE my food processor! Have I said I love my food processor yet? I recently got this and don't know what I did before. Anyway, mix these together. If the mixture is too thick, add a little water. It's nice to have a dip with your veggies or salad that actually feels like it fills you at the same time as tasting good.